Below Bridal Veil falls in Yosemite, the runoff splits into 3 separate streams before flowing into the Merced river. It’s a wonderfully photographic area that often gets over looked by the throng of tourists that come see the falls every day. The platform at the base of the falls is frequently the only place that they stop and look. In terms of photographing the falls, in it’s entirety, the parking lot is actually a better vantage point. I like to work this area while it’s in shade or on an overcast day. The patterns, colors and motion give limitless subjects. It’s an especially nice area in the fall when a carpet of leaves add accents against the wet granite. My usual tool of choice is my 100-400. I often don’t even bring my other lenses when I’m bouldering up one of the streams. Using a long lens, I’m able to isolate tiny cascades or create abstractions. I find that approach much more interesting than trying to capture a grand vista. I generally start at the bottom of the 3rd stream and work my way up, over the boulders, to the platform at the top and then walk down. Walking and climbing over the wet granite isn’t without hazards. I’ve slipped and fallen a number of time but I keep going back. This image was taken near the top of the middle stream. I was at 400mm on my Canon 5D. I set the exposure to 1/8 second at f/16 and ISO 100. I wanted to maintain the feeling of motion in the water without loosing the detail and feel of the surface of the water. I also made sure that I had the snow “tack sharp” to add a contrasting texture to the scene. 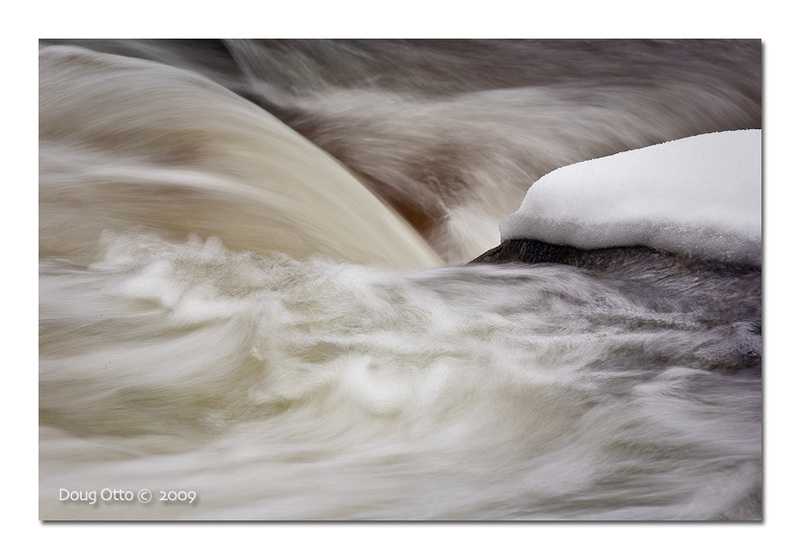 This entry was posted in Photography and tagged bridal veil creek, Canon 100-400, Canon 5D, doug otto, snow, water, winter, yosemite. Bookmark the permalink.